Captivating Discovery Education™ video and stimulating global topics spark curiosity and engage teenage learners. Developed in partnership with Discovery Education™, Eyes Open features captivating Discovery Education™ video and stimulating global topics to motivate students and spark their curiosity. The course offers four videos in every unit making learning relevant and engaging. Guided activities and personalised learning tasks develop greater speaking and writing fluency. 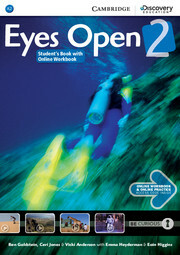 This version of the Student's Book includes access to the online learning management platform with full Workbook content online as well as extra resources, games and interactive video activities. Teachers can use the platform to track students' progress and ensure more effective learning. Student's eBooks and eWorkbooks are also available.